It took nine years, three teams, and an arduous recovery from a ruptured Achilles tendon for DeMarcus Cousins to first crack the NBA playoffs. During his second postseason game, that long-awaited prize was stolen from him. 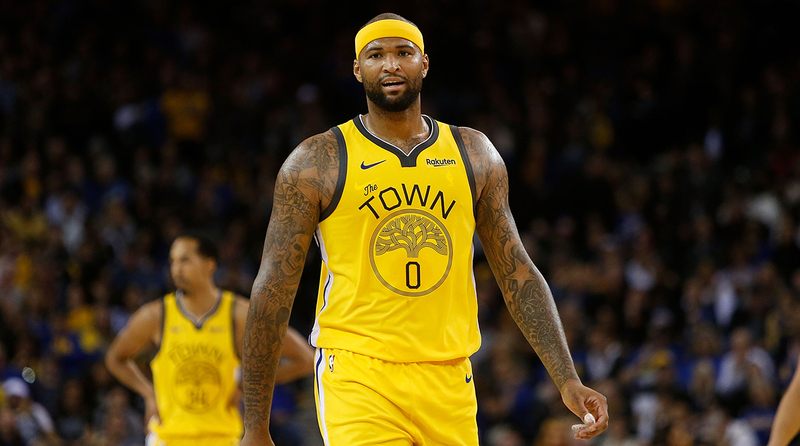 The Warriors announced on Tuesday that Cousins has suffered a torn left quad during Game 2 against the Clippers, with no set timetable for his return. The severity of the tear is still being determined, according to ESPN’s Adrian Wojnarowski, and the best path forward with it. Surgery is an option depending on the specifics involved, though not necessarily required. The culprit, cruelly enough, was a hustle play. While in pursuit of a loose ball, Cousins’ leg gave way to his sprint, sending him crashing to the floor. It was immediately clear that this was more than a misstep. Cousins attempted to lift himself up but winced, clutching at his left leg. Once vertical, he couldn’t even make it through a single step before calling to be pulled from the game. Before there had been an announcement, a report, or an MRI, an unfortunate thought coursed its way through Oracle Arena. Cousins’ season may be over. All those years and all that work for 25 measly minutes of playoff action. The personal stakes were high for Cousins, given that he’ll again be an unrestricted free agent at season’s end. It was the lack of agreeable offers that brought Cousins to the Warriors in the first place. Teams weren’t exactly eager to invest a hefty, multi-year deal in a seven-footer in recovery from a serious injury. At season’s end, Cousins will likely be right back where he started. There’s still so much for him to prove and no real means to do so. Frustration wouldn’t even begin to cover it—not after Cousins’ work ethic and character had been under fire for years, and with a championship run in the works. Whatever validation Cousins might have found in a title will ring hollow now. Golden State doesn’t explicitly need Cousins, who is the fifth star on a team that managed back-to-back titles just fine with four. We know this team is capable of winning a championship with Andrew Bogut as its starting center because it already has. Cousins was an extravagance the Warriors added just because they could. The basketball results have actually been mixed. Cousins bullied his way to dominance in some matchups and stumbled to liability in others. So few players of Cousins’ size can defend in space at all. The long way back from one of the most devastating injuries in basketball only added to the difficulty. Those concerns were corroborated against the Clippers, who had strung out Cousins between Lou Williams and Montrezl Harrell in the pick-and-roll. It’s unfortunate that, in all likelihood, he won’t have the chance to prove otherwise in these playoffs. The lasting image of his defense will be as a traffic cone. Golden State accommodated Cousins all the same because it made a good deal of sense. Exceptions are made where talent is involved, and Cousins is nothing if not talented. You live with the defensive lapses on the promise that he might overwhelm some centers inside or unlock a game with his playmaking. Cousins isn’t the Warriors’ only option at the five or even their best, but he was unquestionably singular. Bogut and Kevon Looney wouldn’t even attempt to contribute in the ways Cousins did. That’s not necessarily a bad thing. Without Cousins, Golden State will be forced to rely on a more reserved template for its center play. Bogut is the rim protector, suited for a style of coverage that keeps him tethered inside. Looney is a counterpoint: a big who is comfortable switching and showing as needed. Neither is perfect, but between the two, mistakes are largely minimized. It’s easy to appreciate Cousins for the simple fact that he does so much more on the court. He also gives more back by disregarding scheme and misplaying his assignments. The real loss is optionality. Between Cousins, Bogut, Looney, and Draymond Green, Golden State had the range it needed to shift styles as the playoffs demand. This injury adjusts the calculus. Not only is the best scorer of the bunch no longer an option, but realistically, Green and the Death Lineup could be called into action more often that Steve Kerr would like. The most important thing a Warriors center can do with their minutes is to use them. Green is clearly the best center on the roster and also unfit to play the position full-time. It’s an untenable arrangement. Golden State is at its best when Green pushes the pace, flies around on defense, and attacks open spaces. To maintain that kind of energy while grappling with and boxing out larger players is downright punishing. Too much exposure will actively make it worse. With that in mind, every minute that another center can spare Green is its own victory—and Golden State, at the very least, just lost 20-25 of those minutes a game. The more desperate their circumstances, the more the Warriors will rely on the Death Lineup. And the more they rely on the Death Lineup, the more ordinary it becomes. Yet so long as the Warriors employ Stephen Curry, Kevin Durant, and Klay Thompson, a situation like this works as more of a stressor than a crisis. Starting Bogut at least helps to ease the transition; in retrospect, his surprise in-season signing seems fortunate, if not prescient. Looney can certainly afford to play more than the 18 minutes per game he’s seen in the playoffs thus far. Kerr even found some playing time for Jordan Bell in Game 2 before the Warriors went belly up, recalling another possible center from his dog house in case of emergency. Even without Cousins, the margin for error is still so wide. Whether it’s wide enough is really up to the Warriors themselves, and whether they choose to approach their remaining games as the kind of team that builds a 31-point lead or the kind of team that blows one.